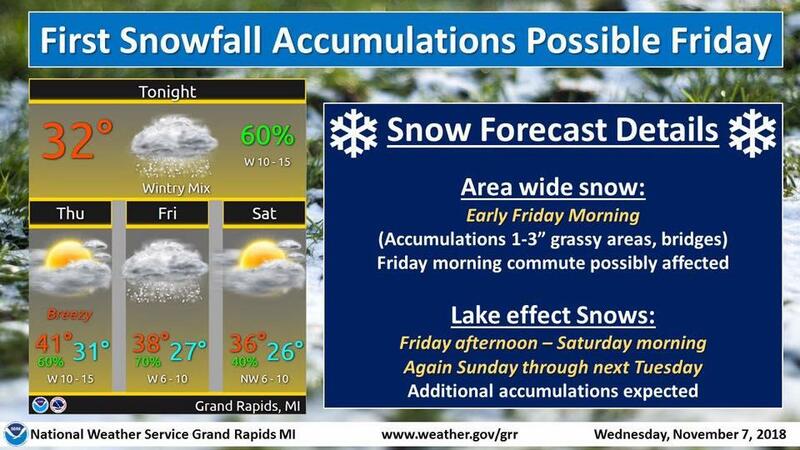 According to the National Weather Service, snow will fall in the Lansing area on Friday. West Michigan will see lake effect conditions. National Weather Service meteorologist William Marino talks about lake effect snow and conditions forecast for West Michigan on Friday. National Weather Service meteorologist William Marino said the snow will not be deep in the Capital region.. but with freezing temperatures, the wet snow will make some roads slick during the Friday morning commute. "It should snow most of the morning. You could get I’m thinking 1-3 inches. It could cause travel problems," said Marino. And this weekend he says will be chilly. "High temperatures are going to struggle to make the mid-30’s and actually if I really want to be honest... I don’t even know if it’s going to make freezing [32 degrees] on Saturday," said Marino. Marino also says people in West Michigan will see lake effect snow and tough driving conditions on Friday. You can always find current conditions and the forecast on WKAR.org. We also share forecast maps on the WKAR News Facebook and Twitter pages. Michigan State University researchers have received a federal grant to study communication after Hurricane Maria, which devastated Puerto Rico. Officials confirm four tornadoes touched down in Michigan's Lower Peninsula over the weekend, knocking down trees and damaging buildings. National Weather Service Sr. Forecaster Bob Dukesherer talks about the four tornadoes that touched down in the Lansing-Jackson area on September 1, 2018. Michigan's Upper Peninsula is getting a taste of wintry weather a little earlier than usual this fall. A spring storm dumped more than a foot of snow in parts of Michigan's northern Lower Peninsula and is blamed for creating hazardous road conditions seen as a factor in three traffic deaths. Several mid-Michigan public schools will be closed on Friday, January 5 because of forecasted bitter cold temperatures. Click here for the list. Subzero temperatures are expected in Mid-Michigan over the next 24 hours, so the region’s largest homeless shelter is preparing to house more people than usual.